The lusciously soupy sauce in this dish hits all the right notes. It has sweet, spicy, tangy, and creamy all nailed. Light and fresh, but rich in flavor. A perfectly pleasing summer supper. In a blender add peeled and diced mango, lime zest and juice, coconut milk, curry powder, tumeric, chili flakes, and honey. Blend until smooth. Cooking is so much a matter of taste. The amounts I list are just starting off points. So taste. Adjust the amounts and flavors to suit you. 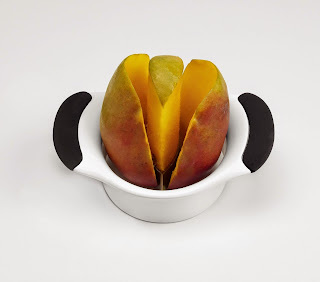 This super awesome gadget makes removing the mango fruit from the stubborn pit easy peasy. Split the mango off the pit remove each side, Score the flesh with a knife. Flip the peel inside out and scrape the flesh from the peel. Click photo to see where to buy. In a large frying pan melt some butter. Add in shrimp and cook on medium high heat. If you are using frozen shrimp, be sure to remove any excess liquid that collects in the pan as the shrimp heat. Otherwise the shrimp will boil and turn rubbery. If using fresh or thawed shrimp be sure to pat them dry with a paper towel before cooking to insure a good sear on them. Shrimp cook quickly. To avoid ending up with rubber bands remove the shrimp from the hot pan as soon as they turn completely coral colored and set them aside. 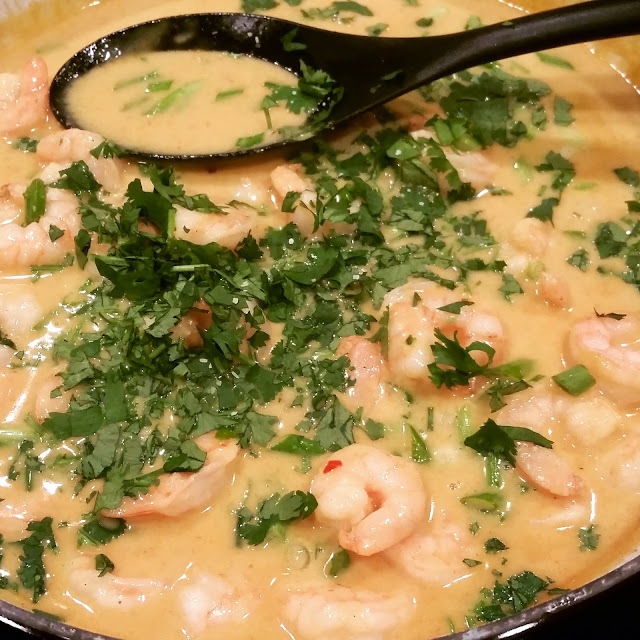 In the same pan, bring the mango curry sauce to a boil and reduce to low heat. Simmer for 15 minutes. Turn off the heat and add in the shrimp. The heat of the sauce will warm the shrimp through without overcooking them. Garnish with chopped green onions and cilantro. Serve spooned over a pile of warm rice, a bed of quinoa, a tangle of lightly steamed greenbeans, or a bowl of thin rice noodles.